Creative IT UK is a leading service provider of Apple laptop logic board repair solutions. The expertise in working with all Apple laptop and notebook makes and models such as iBook G4, iBook G3, MacBook Air, PowerBook G4, PowerBook G3, MacBook Pro and MacBook models allows us to efficiently resolve all types of issues with your specific Apple Mac laptop computer. With a professional Apple laptop repair service team dedicated to solve all your Apple laptop logic board repair or replacement needs, Creative IT UK can fix everything from component level failures to liquid spilled issues you may come across with your portable computer. When we receive your Mac laptop, we will perform a complete diagnostic procedure which ensures highly accurate troubleshooting carried out by our expert repair technicians and electronics engineers. Our technicians are not only skilled in common repair and maintenance services but also in advanced BGA (ball grid array) reballing and reflow techniques. Once we have identified the root cause of your laptop issue, our technicians will inform you of the issue and all possible service options. 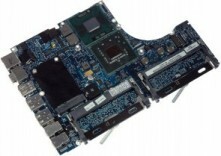 We can also provide an affordable Apple laptop logic board replacement solution for your faulty or malfunctioning system board. One of the major considerations in having your Apple Mac laptop sent in for a repair job is the turnaround time. Creative IT UK provides Apple laptop logic board repair with quick turnaround and we can have your portable computer up and running in less downtime. We ensure standard warranty for all our Apple laptop logic board replacement and support services. You can choose to drop off your laptop at our main repair store in Central London or mail in your laptop to our store address. Let Creative IT UK help you with your Apple laptop logic board repair, troubleshooting or replacement needs. Please give us call on 020 7237 6805 or forward your repair inquiry to us at info@creativeit.tv. You can visit our main repair store in Central London anytime Monday through Saturday, 9:00 am to 6.00 pm.